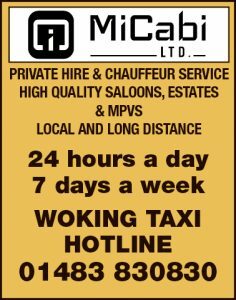 WOKING Athletic Club’s weekly Park Run became a double celebration last week for Halloween and the wedding of two of its members who got engaged at a club event in the summer. 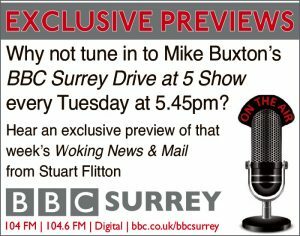 Susanne Barnes and Tim Cooper put on their wedding clothes from the previous day’s small ceremony to celebrate with their running mates in Woking Park. 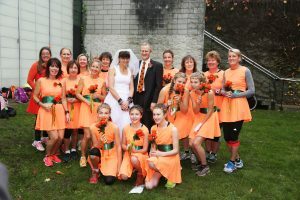 Sixteen of the women and girls dressed as bridesmaids – in the club colours of orange and green, while Fred Bell, a former coach, dressed as a vicar for a fun repeat of the vows. 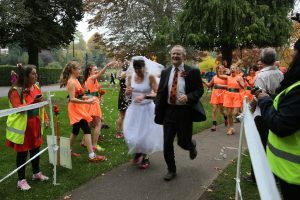 Other club members took advantage of the forthcoming Halloween to dress up as ghosts, ghouls and witches – and all wore their running trainers to take part in the 5k event. The Park Run, which is held by athletic clubs across the country on Saturday mornings, is usually competitive, but last week had a carnival atmosphere with lots of laughter alongside the physical exercise.